Posted by Jace Stolfo on Friday, February 28th, 2014 at 12:56pm. 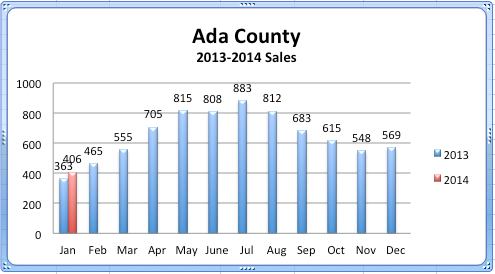 Real estate sales started off on a strong note in Ada County this year. As you can see in the graph above 406 homes sold in January 2014, a 12% increase from January of last year. Historically, January is noted for one of the lowest sales of the year; usually rising until it peaks through the summer months. Last year, July had the highest sales; right at the peak of the heat summer of '13. It will be exciting to see how 2014 reflects new increases in real estate sales as the season transitions through spring and summer. 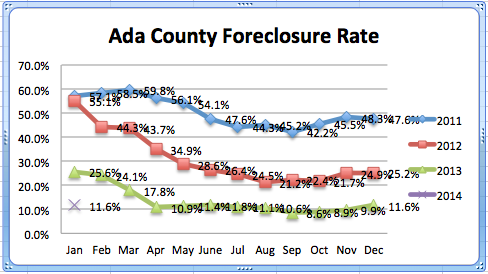 The Ada County foreclosure rate is also continually dropping. As you can see in the graph below foreclosures dropped 14% from last year; foreclosures only accounted for 11.6% of total real estate sales. The foreclosure rate has dropped 43% since the beginning of 2012. Foreclosures really started to fall May of 2013; and has since then stayed low, not peaking above 12% of sales. The absorption rate in January '14 was 5.0 months, loosly translated, this means if there were 100 homes on the market it would take about 5 months for all of the real estate inventory to sell. To see the absorption rate this low early on in the year is very good; it was 42% higher last year and has dropped 76% since 2012 with an absorption rate of 8.8. 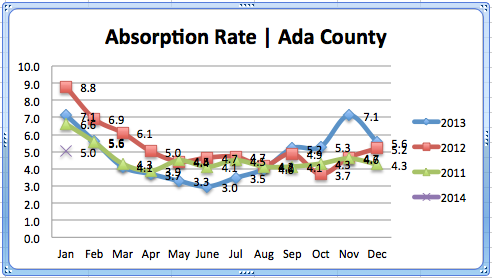 Increasing real estate sales, a decrease in foreclosures and a lowered absorption rate are all factors that contribute to a stable and healthy real estate market in Ada County. 2014 is off to a great start!